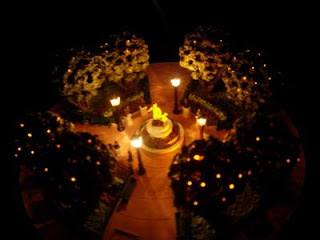 This is a miniature sculpture of Disneyland's Central Plaza by the famed master miniaturist, Robert Olszewski. This item is brand new and in its original box, and has a Certificate of Authenticity. This particular item is also a First Edition, which means that it was made during the first year of production of the piece, and this is indicated on the Certificate of Authenticity. At Disneyland, Central Plaza (which is also known as the Hub) is the area of Disneyland on Main Street which is the circular area which is right across the street from Sleeping Beauty Castle. 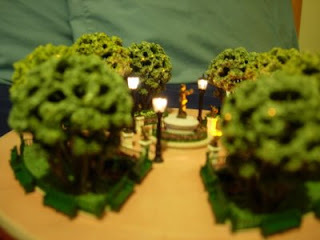 This piece is an exact miniature replica of Disneyland's Central Plaza. This sculpture has fantastic detail. It features the park benches, trees, flower beds and statues in the Central Plaza area of Disneyland. It also includes once of the centerpieces of Disneyland, the statue of Walt Disney holding Mickey Mouse's hand, called "Partners". This piece also lights up with the flick of a couple of switches, as you can see from the pictures- the street lights light up, as well as the lights in the trees, for a really nice "Disneyland after dark" treatment.